Hear Beatle George Harrison perform song “Bangladesh” at the 1971 Concert for Bangladesh at Madison Square Garden, NYC, New York. In just a few weeks, the world will adopt the 2030 Agenda for Sustainable Development. For my country, Bangladesh, the goal of combating climate change and its impacts is crucial, as we are on the frontline of this global threat. Bangladesh is one of the most densely populated countries in the world (1,218 people per sq km), with the lowest quantity of per-capita arable land (0.05 hectares). Although we made considerable progress on the Millennium Development Goals (MDGs), climate change in the form of extreme-weather events, tidal surges, and erratic rainfall has negatively impacted agricultural production, industrial development and social structures. 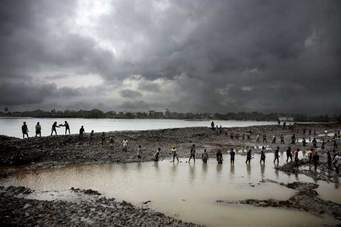 This can create millions of environmental refugees, even though Bangladesh’s contribution to climate change in terms of greenhouse-gas emissions is negligible. And the situation will worsen without urgent action. Studies estimate that a meter rise in sea level would submerge one fifth of the country, displacing over 30 million people. Mass migration to cities is inevitable, impacting livelihoods, biodiversity, food, water, sanitation and basic infrastructure. That is why we are keen to see the Sustainable Development Goals (SDGs), and the upcoming climate agreement in Paris, adopted and moving into implementation. But Bangladesh has not been sitting around waiting for the world to save us. We are fighting for our own future, albeit with limited resources and technologies. In 2011, we amended the constitution to protect and improve the environment and preserve and safeguard natural resources, biodiversity, wetlands, forests and wildlife for present and future citizens. In line with this policy, at least eight new laws were enacted or amended since 2009 to preserve forest lands in the country. Forest coverage rose to 17.08 percent in 2014-15 from a mere seven to eight percent in 2005-06, thanks to the introduction of initiatives such as the Social Afforestation Program, which ensures people’s participation in planting and raising trees in every available space, both urban and rural. Currently, more than 120 million saplings are raised and distributed every year among the people, compared to 40 million in 2001-2006. Bangladesh was the first developing nation to create a Climate Change Strategy and Action Plan. From 2009-2010 to 2014-15, the government allocated Tk 30.30 billion (US$ 385 million) to our climate-change trust fund. All of our activities have been targeted toward adaptation to environmental changes with a view to protecting human lives from floods and hurricanes, and protecting the environment from pollution caused by rapid urbanization and unsustainable industrialization. There are so many examples of specific actions we undertook as part of our policy framework. We have built about four million solar-home systems in off-grid areas and 1.5 million improved cook stoves to decrease indoor air pollution. We created the Coastal Greenbelt Project to protect the southern part of Bangladesh, which is surrounded by the Bay of Bengal, from cyclones. Dense forest covers along the coastline, particularly mangroves, form an effective buffer. By boosting this cover, we helped reduce the death toll to about 200 from the hurricanes Aila in 2009 and Mahasen in 2013 combined, compared to 140,000 in a single cyclone in 1991. We have also made remarkable progress in food production. Bangladesh has become a food-exporting country from a food-importing country over the last six years. Our scientists have developed almost 200 varieties of crops that are resilient to changing climactic conditions and techniques to grow crops in less fertile soil. Rice production was 33.30 million metric tons in 2008-09. It was 38.34 million metric tons in 2013-14. Despite these efforts, climate change continues to affect the lives and livelihoods of millions in our unique and active delta. This year, we experienced 50 percent more rainfall than average, inundating vast areas of the country and damaging crops. Climate change may threaten our wheat and major rice-crop (Boro) production. Studies suggest that two to three percent of our Gross Domestic Product may be wiped out because of climate change. We cannot do it alone, which is why we need the international community to stand up for nations such as ours through the SDGs and the climate-change process. In order to address climate change, a critical balance between adaptation (adjusting to the impacts of climate change) and mitigation (reducing the scale of climate change) will have to be maintained. The pledges on reducing emissions submitted for the Paris climate meeting must be measurable and verifiable. The world should pay attention to carbon budgeting and de-carbonization pathways. For adaptation planning, adequate and predictable financing is essential. Bangladesh has been leading by example, and we are ready to share our experiences on climate resilience with rest of the world. I hope that the United Nations Environment Program honoring me with the Champions of the Earth award this year will draw attention to Bangladesh’s efforts, which show that we can make a difference, and encourage developed nations to bring their resources to bear on the greatest challenge of our time.